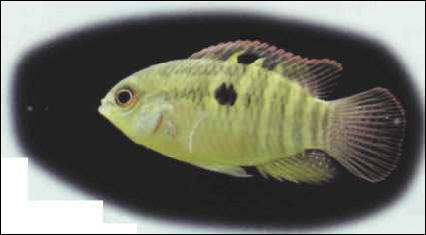 The flag cichlid, not to be confused with Mesonauta festivus, which shares its English name, is a small species from the Amazonian basin, and peaceful enough except at spawning time. The female deposits up to 1,000 eggs on a suitable surface; both parent fish then keep guard. The fry cling to their support by means of a substance secreted from glands on the head; when they become free-swimming feed them on Artemia nauplii. Size: 8 cm. ЕНЕЙ Евгений Евгеньевич (1890-1971) , российский художник кино, народный художник СССР (1969). Фильмы:"Обломок империи" (1929), "Юность Максима" (1935), "Возвращение Максима" (1937), "Дон Кихот" (1957), "Гамлет" (1964) и др. Государственная премия СССР (1948).